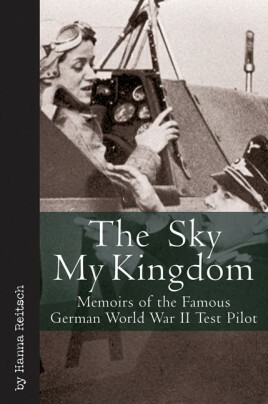 The Sky My Kingdom is the fascinating autobiography of the famous World War test pilot - Hanna Reitsch (March 29, 1912 - August 24, 1979). As the war progressed, Reitsch was invited to fly many of Germany's latest (and increasingly desperate) designs, including the rocket-propelled Messerschmitt Me 163 Komet, and several larger bombers on which she tested various mechanisms for cutting barrage balloon cables. After crashing on her fifth Me 163 flight, she was badly injured but insisted on writing her report before falling unconscious and spending five months in hospital. Eventually she became Adolf Hitler's favorite pilot. Reitsch was one of only two women awarded the Iron Cross First Class during World War II, and the only woman awarded the Luftwaffe Combined Pilot and Observer Badge with Diamonds. She survived many accidents and was badly injured several times. In the last days of the war Reitsch was asked to fly her companion, Colonel-General Robert Ritter von Greim, into Berlin to meet with Hitler. The city was already surrounded by Red Army troops who had made significant progress into the downtown area when they arrived on the 27th April, landing on a city street, and traveled to the Führerbunker. The aircraft she used was the justly famous Fieseler Storch already well known for the exploit that rescued Mussolini, only adding to the legend of both Reitsch and that aircraft. She is said to have overheard Hitler laying out plans for Nazi commanders to join together in mass suicide when it was obvious that the war was over. She also hoped to fly out propaganda minister Joseph Goebbels' six children, who had been staying in the bunker since April 22 with their parents, but neither Joseph nor Magda Goebbels would allow it. She escaped Berlin on 29th April by flying out through heavy Russian anti-aircraft fire. She was a devoted and idealistic Nazi, who adored Adolf Hitler and refused to believe the reports of concentration camps and torture. Not until much later would she say that she had been "disgusted" by what she witnessed in the Third Reich. She was held for 18 months by the American military after the war, she was interrogated and subsequently released. After the war German citizens were forbidden from flying, except, after a few years, in gliders. In 1952 Reitsch won third place in the world gliding championship in Spain (and was the only woman who competed). She continued to break records including the women's altitude record (6848 meters) and became German champion in 1955.